Sea level rise will likely shift estuarine plant and animal communities as tidal inundation and salinity regimes change over time. More severe winter storm events may cause increased bank erosion in exposed sections of the bay, increasing turbidity and land-derived bacteria and nutrient inputs. Should decreases in summertime precipitation occur, the reduced availability of freshwater could result in seasonal increases in stream water temperatures and turbidity, localized increases in salinity in tidal areas, and decreases in dissolved oxygen concentrations. There is inherent uncertainty in predicting what the local effects of climate change are likely to be. The uncertainties generally fall into three categories: 1) Natural variability of the earth’s climate; 2) Climate sensitivity (how the earth’s climate system responds to increases in future greenhouse gas levels); and 3) Future greenhouse gas emissions. To manage for these uncertainties, climate scientists use multiple models (“multi-model ensembles”) that incorporate the estimated range of possible natural variability, climate sensitivity, and future greenhouse gas emission values when investigating climate-related change. The models typically generate a range of values for potential future air temperatures, ocean surface temperatures, sea level rise, etc., which naturally become increasingly variable the longer into the future the model predicts. This approach gives communities a range of projections to consider when developing climate change vulnerability assessments and adaptation plans. In the future, precipitation in coastal Oregon is expected to remain a predominately wintertime phenomenon (i.e., most precipitation will continue to occur in the winter). However, the extent to which precipitation timing, frequency and intensity on the Oregon coast may change in the future remains uncertain. There is evidence that high-intensity storms are becoming more frequent, and that the frequency of weak to moderate-strength storms is declining. Climate-related hydrologic changes (i.e., changes to water movement, such as river flow, ocean inundation, estuary flushing, etc.) will likely be the most significant cause of variations in water quality. The timing and quantity of freshwater contributions to estuaries from coastal creeks and rivers will change depending on climate-related changes to precipitation patterns. For example, climate modeling of a maritime watershed in British Columbia, where spring/summer precipitation is expected to decrease while fall/winter precipitation is expected to become increasingly intense, floods will become more common in fall/winter while droughts would become more prolonged during spring/summer (Loukas et al. 2002). In fact, summertime drought conditions could be further exacerbated in estuaries where water managers divert more water to reservoirs in response to dryer conditions (Scavia et al. 2002). Lower summer flows could add to decreased dissolved oxygen levels and increased temperatures, especially in the upper reaches of the estuary (see Increasing Hypoxia Events and Increasing Temperatures below). Heavier winter storm flows could increase the frequency of large scale slope failures in coastal watersheds, resulting in high turbidity levels. According to Whitehead et al. (2009), the increased frequency and intensity of coastal storms could also lead to the re-mobilization of heavy metals and contaminants from the sediment to the water column. Higher seasonal flood waters could heighten terrestrially-derived bacteria and nitrogen inputs, which, combined with expected decrease of spring/summer flushing, may create conditions for the development of hypoxic (low dissolved oxygen) zones in estuarine waterways (Scavia et al. 2002). Increased winter flows and reduced summer flows will affect the estuarine salinity regime. According to the 2010 Oregon Climate Change Research Institute (OCCRI) report, dry season salinity can be expected to increase over time, which will likely change estuarine plant and animal communities, and possibly create openings for the establishment of new or spread of existing invasive species. However, distinguishing the effects of climate change on water quality variables versus those of human-generated change is difficult. Possible effects specifically derived from climate change are described below. Since the late 18th century, the worldwide average ocean surface pH levels have decreased by about 0.1 pH units, a decrease of pH from about 8.2 before the industrial revolution to about 8.1 today. A 0.1 change in pH is significant because it represents about a 30 percent increase in ocean acidity (the pH scale is logarithmic, meaning that for every one point change in pH, the actual concentration changes by a factor of ten). Scientists estimate that by 2100 ocean waters could be nearly 150% more acidic than they are now, resulting in ocean acidity not experienced on earth in 20 million years. The best Pacific Northwest ocean acidification data we have so far are from the Puget Sound area, where pH has decreased about as much as the worldwide average (a decrease ranging from 0.05 to 0.15 units). Precipitation shifts are also expected to: 1) increase storm-driven hydrologic exchange (flushing) in estuarine and coastal waterways during the rainy season; and 2) decrease summertime flushing (Moore et al. 1997 as cited in Scavia et al. 2002). Decreased flushing can cause a buildup of nutrient-laden waters, which in turn will allow phytoplankton blooms to occur, possibly leaving the estuary more susceptible to eutrophication in the future (Scavia et al. 2002). Increasing ocean acidity is expected to have major consequences for aquatic life such as plankton and mollusks (e.g., clams, oysters) that incorporate calcium carbonate into their shells (OCCRI 2010). These life forms are particularly sensitive to low pH waters which thin their shells by dissolving the calcium carbonate. The effects of acidification in the Coos estuary are still being investigated. Estuarine carbonate chemistry is more complicated than ocean acidification due to watershed influences, aquatic respiration, and primary production from submerged aquatic vegetation (e.g., eelgrass). Researchers at the South Slough National Estuarine Research Reserve (SSNERR) recorded pH levels actually climbing (become less acidic) in South Slough waters but determined it was a relative short duration trend and possibly part of the larger pH variability in the estuary. This long-term monitoring and research is actively improving our community’s ability to understand trends in Coos estuary pH levels. Overall, Oregon estuaries are predicted to experience an increase in water temperature consistent with warming ocean waters (OCCRI 2010). According to the OCCRI report (2010), the influence of increasing ocean temperatures may be compounded by decreased freshwater flow in summer should summertime drought conditions become more frequent on the Oregon coast. 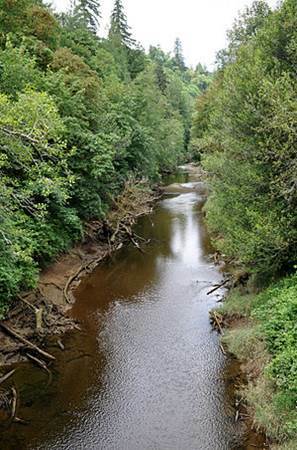 Those same drought conditions (low stream flows, elevated air temperatures) will likely exacerbate the poor water quality in Coos estuary tributary streams already approaching or exceeding state water temperature standards. Hypoxia is commonly defined as dissolved oxygen (DO) levels less than 2.0 mg/L, although stress to organisms begins before reaching that benchmark (USEPA 2000). Decreases in DO are common during warm summer conditions in the relatively shallow Coos estuary and frequently drop below Oregon Department of Environmental Quality’s (ODEQ) DO standards. According to the OCCRI report (2010), DO levels could further decrease with higher water temperatures (warm waters hold less oxygen than cool waters) and other hydrologic changes (e.g., decreased estuary flushing). Further, increased advection of low-oxygen ocean water into the lower portions of the estuary during periods of intense summertime upwelling could potentially lower dissolved oxygen levels in the estuary (OCCRI 2010). Especially hazardous are occurrences of severe ocean hypoxia (<0.7 mg/L)(PISCO 2008) which have been observed in recent years off the Oregon coast. Chan et al. (2008) found no evidence of nearshore severe hypoxia prior to 2000, but severe hypoxia events have become relatively common in Oregon’s nearshore ocean since 2006. Severe hypoxia was seen in August, 2014 along the 15 m ocean bottom contour line and deeper (F. Chan and J. Barth pers. com. August 20, 2014). Rising sea levels will be an important factor affecting estuarine functions. According to the OCCRI report (2010), estuarine salinity is expected to increase due to increased seawater intrusion from rising sea levels; the location along the estuarine salinity gradient will be a key factor in determining levels of oceanic water intrusion for individual sites. Even small salinity increases are expected to shift the spatial distribution of estuarine plant and animal communities, affecting dominant tidal marsh plant communities (Callaway et al. 2007). OCCRI (2010) further reports that rising sea levels will be compounded by strong El Niño events, resulting in increased flooding and bank erosion, which in turn will cause an increase in water turbidity. For example, in Yaquina Bay, monthly mean water levels in the winter months (November-March) were on average 30 cm higher during strong El Niño years, causing increased erosion and turbidity. Based on the upwelling index at our latitude in the northeastern Pacific, upwelling-inducing winds are expected to increase in intensity and generate stronger upwelling events (Bakun 1990). The OCCRI report (2010) also predicts intensification of coastal upwelling which is expected to affect nutrient inputs to Oregon’s estuaries. In the Coos estuary, tidally driven inundation during strong upwelling coupled with sea level rise would allow phosphate-rich oceanic water to intrude further into estuarine environments, and would especially increase summertime nutrient inputs. Likewise, cold waters with low DO levels may also intrude farther up the Coos estuary during strong summertime upwelling events . Brown and Power (2011) found that cold flood tide waters near the mouth of the Yaquina estuary contained severely low dissolved oxygen levels (minimum value of 0.4 mg/L) during summer upwelling events. 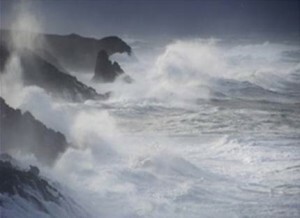 Findings from the OCCRI report (2010) indicate the intensification of North Pacific storms will bring increased wave heights to Oregon’s outer coast beaches and lower estuarine shorelines. Larger waves propagating up the estuary to exposed shorelines would likely cause increased erosion leading to higher turbidity levels for lower estuarine waters. Our local NOAA tide station in Charleston has documented an average rate of sea level rise (SLR) of 0.84 mm (0.03 inches) per year averaged over the past 30 years (0.27 feet in 100 years). The rate of SLR is expected to accelerate over time. For example, the National Research Council (NRC), predicted SLR rates as high as +23 cm (9 inches) by 2030; +48 cm (19 inches) by 2050; and +143 cm (56 inches) by 2100 for the area to the north of California’s Cape Mendocino (the study’s closest site to the Coos estuary). Physical conditions in an estuary are sensitive to changes in long-term oceanographic fluctuations. O’Higgins and Rumrill studied the physical response of the South Slough estuary to changes in the Pacific Decadal Oscillation (PDO) index by monitoring South Slough water quality from 2000 to 2006. Their data show a positive and statistically significant relationship between temperature and the PDO index but a negative and statistically significant relationship between dissolved oxygen and the PDO index. This suggests that local estuaries are both anomalously warm and less oxygenated during the warmer (positive) phases of the PDO. Similarly, Hamilton has studied the relationship between the physical conditions of local waters and El Niño Southern Oscillation (ENSO) events between 2004 and 2010. Her data demonstrate a positive and statistically significant relationship between temperature and a multivariate ENSO index at stations in Charleston, South Slough’s Valino Island, and South Slough’s Winchester Creek. Bakun, A. 1990. Global Climate Change and Intensification of Coastal Ocean Upwelling. Science. 247(4939): 198-201. Brown, C.A., and J.H. Power. 2011. Historic and recent patterns of dissolved oxygen in the Yaquina Estuary (Oregon, USA): Importance of anthropogenic activities and oceanic conditions. Estuarine, Coastal and Shelf Science. 92 (3): 446-455. Callaway, J. C., P. V. Thomas, M. C. Vasey, and L. M. Schile. 2007. Emerging Issues for the Restoration of Tidal Marsh Ecosystems in the Context of Predicted Climate Change. Madroño. 54 (3): 234-248. Chan, F., J. A. Barth, J. Lubchenco, A. Kirincich, H. Weeks, W. T. Peterson, and B. A. Menge. 2008. Emergence of Anoxia in the California Current Large Marine Ecosystem. Science. 319 (5865): 920. Cornu, C.E., J. Souder, J. Hamilton, A. Helms, R. Rimler, B. Joyce, F. Reasor, T. Pedersen, E. Wright, R. Namitz, J. Bragg, B. Tanner. 2012. Partnership for Coastal Watersheds State of the South Slough and Coastal Frontal Watersheds. Report prepared for the Partnership for Coastal Watersheds Steering Committee. South Slough National Estuarine Research Reserve and Coos Watershed Association. 225 pp. Feely, R.A., S. R. Alin, J. Newton, C. L. Sabine, M. Warner, A. Devol, C. Krembs, and C. Maloy. 2010. The combined effects of ocean acidification, mixing, and respiration on pH and carbonate saturation in an urbanized estuary. Estuarine, Coastal and Shelf Science. 88 (4): 442-449. Hamilton, J. 2011. SWMP Bio-monitoring: Final Report (2004-2010). South Slough National Estuarine Research Reserve. Charleston, OR. Loukas, A., V. Lampros, and N.R. Dalezios. 2002. Potential Climate Change Impacts on Flood Producing Mechanisms in Southern British Columbia, Canada Using the CGCMA1 Simulation Results. Journal of Hydrology. 259:163-188. Moore, M. V., M. L. Pace, J. R. Mather, P. S. Murdoch, R. W. Hogwarth, C. L. Folt, C. Y. Chen, H. F. Hemond, P. A. Flebbe, and C. T. Driscoll. 1997. Potential effects of climate change on freshwater ecosystems of the New England/mid-Atlantic region. Hydrological Processes 11:925-947. National Research Council (NRC). 2012. Sea-Level Rise for the Coasts of California, Oregon, and Washington: Past, Present, and Future. The National Academies Press, Washington, DC. 201 pp. O’Higgins, T. and S. S. Rumrill. 2007. Tidal and Watershed Forcing of Nutrients and Dissolved Oxygen Stress Within Four Pacific Coast Estuaries: Analysis of Time-Series Data Collected by the National Estuarine Research Reserve System-Wide Monitoring Program (2000-2006) Within Padilla Bay (WA), South Slough (OR), Elkhorn Slough (CA), and the Tijuana River Estuary (CA). Final Report Submitted to the NOAA/University of New Hampshire Cooperative Institute for Coastal and Estuarine Environmental Technology (CICEET). Oregon Climate Change Research Institute (OCCRI). 2010. “Chapter 6. Impacts of Climate Change on Oregon’s Coasts and Estuaries”, in Oregon Climate Assessment Report. K.D. Dello and P.W. Mote (eds). College of Oceanic and Atmospheric Sciences, Oregon State University, Corvallis, OR. Scavia, D., J. C. Field, D. F. Boesch, R. W. Buddemeier, V. Burkett, D. R. Cayan, M. Fogarty, et al. 2002. Climate Change Impacts on U.S. Coastal and Marine Ecosystems. Estuaries. 25 (2): 149-164. South Slough National Estuarine Research Reserve (SSNERR). 2013. Unpublished raw data. United States Environmental Protection Agency (USEPA). 2000. Ambient Aquatic Life Water Quality Criteria for Dissolved Oxygen (Saltwater): Cape Cod to Cape Hatteras. Office of Water, Washington, D.C. 55 p.
Whitehead, P. G., R. L. Wilby, R. W. Battarbee, M. Kernan, and A. J. Wade. 2009. A review of the Potential Impacts of Climate Change on Surface Water Quality”. Hydrological Sciences Journal. 54 (1): 101-123.